Kazakhstan Host International Forum to Discuss "Future Energy"
ASTANA, Kazakhstan, June 11, 2013 Oil-rich Kazakhstan is taking a lead in steering Central Asian region in becoming a pioneer in alternative energy resources. Kazakhstan government, led by President Nursultan Nazarbayev, has committed itself to launch an unprecedented challenging campaign to go green to reap the benefits of renewable energy in the coming years.More than 800 delegates from over 35 countries are slated to descend in capital Astana on October 8-9, 2013 to take part in the VIIIth edition of KAZENERGY Forum that would discuss "Future Energy- Eurasian Prospects." Besides some heads of states and leading politicians, senior experts from the field of energy, gas, oil and renewable energy will take part in the two-day meeting. The vision, strategy and key approaches towards Future Energy would be discussed during the conclave. Benefits, risks and prospects of the Future Energy will also be discussed at the Forum. The international meeting would be hosted by KAZENERGY, an association of more than 50 major national and international energy companies including production, processing, transportation, and service companies as well as those of power and nuclear industry. The Association aspires to promote the sustainable development of the oil-gas and power industry in Kazakhstan. The meeting will host deliberation between the participants on the future of hydrocarbon resources and how to meet the goals of attaining energy through non-conventional resources. Kazakhstan is leaving its imprint on the global issue of sustainable energy as the KAZENERGY Forum continues to grow out of its national format into an event that establishes its importance on the international scale. President Nursultan Nazarbayev has already unveiled a vision 2050 plan that aims at putting Kazakhstanin the top 30 competitive nations in the world. The nation has already launched an ambitious Green Bridge initiative under which it plans to produce 600 megawatts through non-conventional resources in the next couple of years to coincide with the hosting of EXPO-2017. The Green Bridge initiative has already received the support of the international community at the UN's Rio +20 Summit and the backing of countries making up three-quarters of the world's population. Major foreign investors including the European Development Bank, the International Finance Corporation, and partner governments have expressed an interest in taking part. Prime Minister of Australia Johan Howard, German Chancellor Gerhard Schroder, Prime Minister of SpainJose Maria Aznar and President of Poland Aleksander Kwasniewski are among the leading dignitaries that have participated in previous editions of the KAZENERGY Forum. 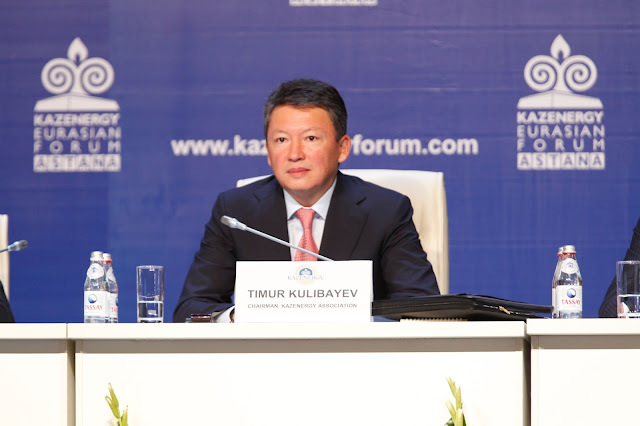 The Chairman of KAZENERGY, Timur Kulibayev said, "The Forum contributes more effective cooperation of industrialized and producing nations and it facilitates the development of mutual understanding and international partnership." According to Kazakhstan Prime Minister Serik Akhmetov, "KAZENERGY Forum is becoming a recognized international dialogue platform for discussing the most sensitive issues facing national and global energy issues." On the sidelines of the two-day event, KAZENERGY Youth Forum will be held in which youth of the nation will hold constructive negotiations concerning the upcoming challenges in the Energy sector in the coming years.